Sage Hen is a bit south of Mono Lake and Lee Vining on US 395. It provides a view that will show you why so many can just stand and stare at the scenery. See the photo gallery! Now all we have to do is to form up with Friends of Inyo or some similar group to clear sagebrush from the edge of the road for a 100 yards or so and we can have a rally at a camping area just a bit down from the summit. From there to the top needs some 4×4 low gears action but the view is something else. Airstreams sighted at Obsidian Dome! The WBCCI Sierra Nevada Unit had a rally at Obsidian Dome. This is in the dispersed National Forest Camping near Lee Vining. Its another one of those camping experiences where you head down the trail trusting the SNU scout (Rick) to know you will be able to traverse the road to a good camping spot. See the gallery! The 8000 feet plus altitude helped keep things cool as did the showers. The showers also helped keep the dust down and smells up. Another one of those ‘do we really have to head back to civilization, now?” weekends with good friends. The lawn is moving! It was interesting to see so many bunny rabits about – maybe the coyotes retreated? 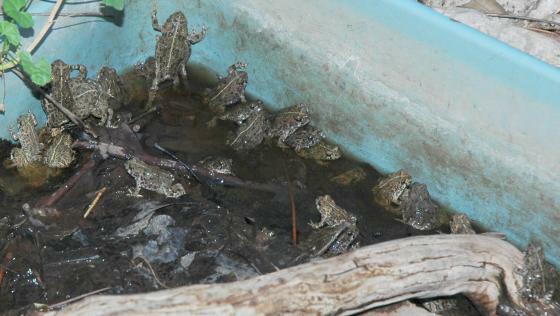 But now there seems to have been a frog hatch and there are small hopping things all over the place. Here is what happens if you have a bit of water in a convenient place. At least these guys should keep the mosquitos down and they do go after ants, too. Cute little things. For now, anyway. But a real hazard if you don’t want the tragedy of stepping on one of them. JV’s Travel & RV Pages is a good place to start if you have some time and want to find things RV on the web. It is a part of Jon Vermilye’s Photo & Travel Website. What sets his links apart is that they are well categorized, have succinct commentary to identify the nature of the link, and the plethora of resources. It looks like Jon is involved with the State University of New York at Oswego and has a special interest in theater and stage photography. His website is a good example of the KISS principle. Keep It Simple and provide good information that is easy to find. There has been quite a brouhaha in southern Nevada when the health department took after casino campers. The idea was that any RV needed an RV park if they were going to park overnight. This did not make many people very happy. While the regulations are an improvement in that these ‘public accomodation facilities’ do not need to meet RV Park regulations to allow SCRV’s to park on their lots, they do need to (a) register with the health department and (b) provide a bit more than just a place to park. What seems to remain unaddressed is how the health department’s interpretation of the state laws regarding RV parks will serve as a precedent for any other limited facility camping area such as state parks or federal government dispersed camping areas. As the RV experience gets ever more popular and the vehicles ever more able to remain off grid, the intrusion of law and regulation on where and how you can enjoy the RV experience needs careful monitoring. Like in southern Nevada, there are times when a bit of civic involvement and agitation will be needed to avoid excess. Now that an extraordinary summer hot spell appears to be breaking, the BBC has published an article on Hot weather risks with advice on how to handle the hot weather. You’ve heard the old 8 glasses a day of water? For a bit more precision, try “As a general rule, for every 2lbs of body weight, you need one ounce of water.” The 8 glasses is for an average 128 lb human. You can usually depend upon your thirst to guide you in getting enough to drink but distractions can sometimes cause a bit of dehydration. For clothing you need something that will protect you from the sun yet allow for perspiration. Wear a wide brimmed hat and use sunglasses to protect your eyes. The sunglasses should be UV resistant and not just shades. Those under 4 or over 65 are at particular risk as they adapt slower to heat. They need to pay particular attention to signs of heat stress and stay cool. Not mentioned in this article is altitude. Thinner air means that exercise is going to have more of an impact and it also means that the sun is more vicious. When it gets hot and the sun is in full force, take it easy and don’t overdo it. The Oregon Scenic Byway, Highway 31, travels alongside the Fremont National Forest. At Paisley, it meets up with the Chewaucan River for a ways. If you head south on Mill St in the center of Paisley, you head up the canyon that is first BLM lands and then NFS. 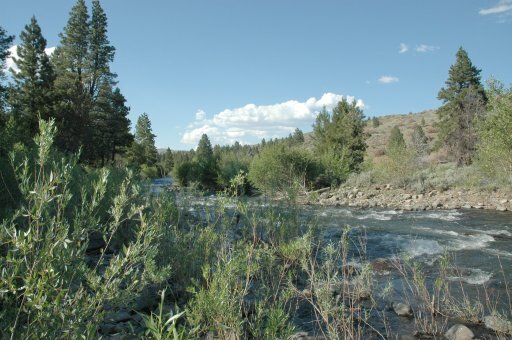 Marster Springs campground, with 9 spots on the river, is just a short ways up the canyon. 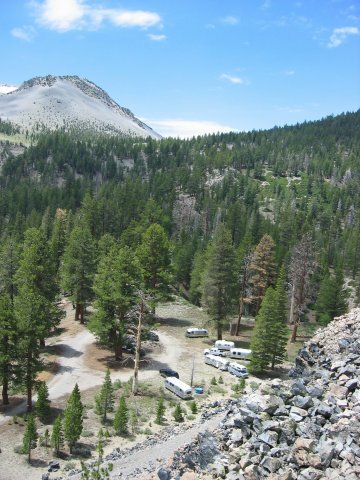 Here’s a photo gallery of the campground and canyon from July 2006. There is a Ranger office on the east side of Paisly right on Highway 31 where you can stop for information and maps during business hours. The thing to do when a heat wave hits around here is to head for the hills. 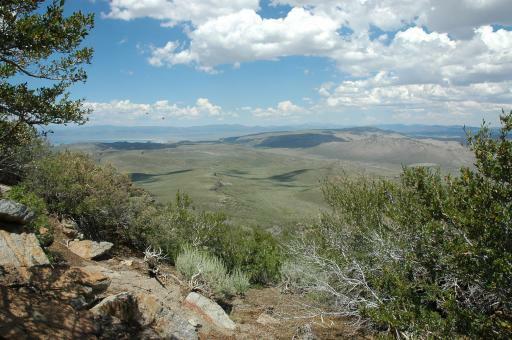 Here’s the view from a spot near Mono Lake and Obsidian Dome. A record yesterday in Reno at 104F and hot and muggy this morning is due to a very stable high pressure ridge that looks like it will be around a while. The Obsidian Dome Rally will be looking at hot afternoons (90F +/-) with warm nights (maybe below 60F) and as much as a 30% chance of afternoon thunderstorms. Going to an Eastern Sierra Rally this weekend? Rick passes along a warning about getting gas on your way to and from the Obsidian Dome rally site. Fuel prices are out of sight in Mono County. It is best to get fuel at Topaz prior to coming down. You should have enough to get back there. If not a short trip to Mammoth which has the lowest fuel prices around here. Here is a rundown on the latest prices in Bishop. You can also look for prices in the Mammoth Lakes, which has prices about fpirty cents higher by changing the area selection. I didn’t see Bridgeport on this site. Maybe its prices are too high? The gas price temperature map has that section of California looking like Death Valley in a heat wave. Check the entry on gas prices for links to Nevada Gas Price sites. As always when traveling in these parts, keep a good fuel reserve in your tank at all times. There are some long stretches between gas stations and what you find when you get there may not make for a pleasant experience. Obsidian Dome – 37degrees 44.986′ lattitude 119 degrees 01.338′ longitude at 8162 feet. For weather and almanac information see Mammoth Lakes Weather or NWS The rally site is a bit higher in elevation than Mammoth Lakes and that means it should be a few degrees cooler. 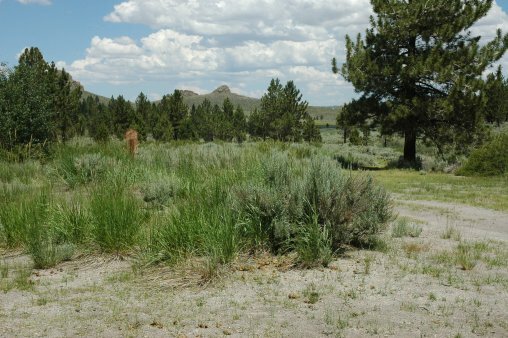 For a rundown on the geologic history of the area, try Molossian Institute of Volcanology – Long Valley Caldera. If you like roads out in the middle of nowhere, Washoe Route 447 from Gerlach Nevada to Cedarville California will fit the bill. This is one way to get from route US 95 to US 395 bypassing Reno. It is an old two lane county road with narrow lanes but very little traffic and an eyeful of scenery. It needs maintenance and is marked for it but there aren’t any showstoppers en route. The photo gallery ends at Goose Lake Oregon State Park on US 395 going north. The $16 for water and electric with a dump station, lots of spaces, and pleasant surroundings makes for a very good overnight stop if travelling US 395. From Reno, the Gerlach express route on Washoe 447 is a bit longer than a direct route up US 395 to Goose Lake. From US 95 near Fernley, it would likely be shorter. If you aren’t in too much of a hurry and are looking for wide open spaces, this route is well worth considering. See the route photo gallery! See all the Salem WBCCI Photo Galleries? The complete roster of WBCCI 49th International Rally at Salem photo galleries in its current revision is on the I’Rally review page. Here is where it stands now. The bull pen – the arrival queue for parking at the Fairgrounds. Airstreams at Rally set up for a week long get together at the Oregon State Fairgrounds in Salem. Vintage Airstreams starting with a parade to their parking area and showing the many variations of Airstream design over the years. Fairgrounds – the facilities where the Rally was held. Ceremonies and Events – the formal organization activities that make this an annual conference of the WBCCI. Exhibits, vendors, and registration – the registration desk and the vendors and exhibitors that could help you improve your RV experience. Shade – hot weather means shade is welcome. Here are some example of how to get shade. Contests – Encouraging the local Units to communicate better and serve their members with publications and other contests. Workshops to learn about organization leadership. Support services for electricity and sewer and those other things needed for comfortable and safe living are a big deal when you start without any infrastructure to handle them. Pets were there, too. Here are a few of them doing what they do best. And the galleries for the Gerlach to Cedarvile highway (Washoe 447), Oregon Outback, Chewacca River Canyon, and the Cascades are yet to come. These will get posted over in Destinations. 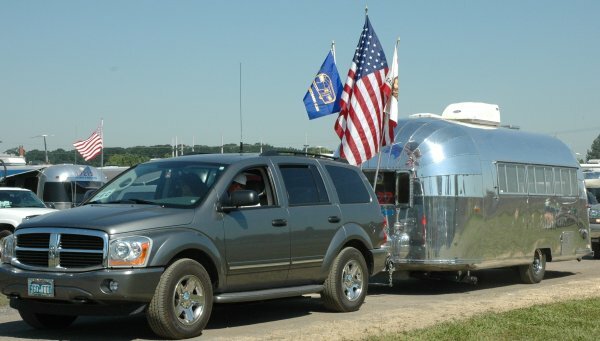 Study these pictures and you can see how Airstream has changed over the years. There are some pictures that show a row of tails that illustrate how the hind end has changed over time. Others show the panel configuration at the top ends. There may be one showing even a tube frame. The gallery also shows the parking process as trailers come down the line from the bullpen and are placed in the Vintage area with 3 amp or 30 amp service as registered. Lorelle VanFossen has a very complete handbook for those who take their pets traveling in the Taking Your Camera on the Road weblog. The focus is international airplane travel but the ideas and suggestions are good for all travelling with pets. It’s not only about the paperwork and hassles of ticketing and boarding, it is also about food, water, waste, pet carriers, tagging, training the pet to know its name, and escape contingency planning. This is the wisdom from someone who has been there, done that and covers all the bases. Always reassure the animal that they’ve done good, no matter what they do, and have a lot of patience. Some animals just won’t “go” while traveling, so make sure you keep giving them water and make the whole trip as stress-less as possible for them to help them through. A photo gallery of a few of the pets at the WBCCI 49th International Rally at Salem is now up. 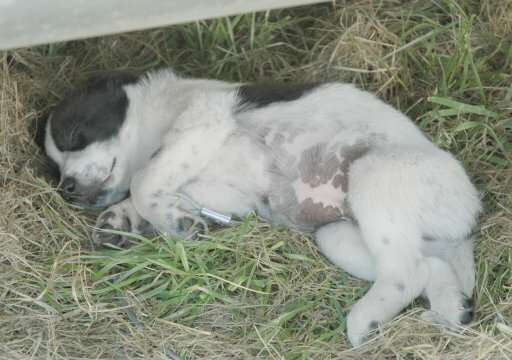 Here’s a rather young one recuperating from an exhausting day. WBCCI Leaders Learn, see the photos! 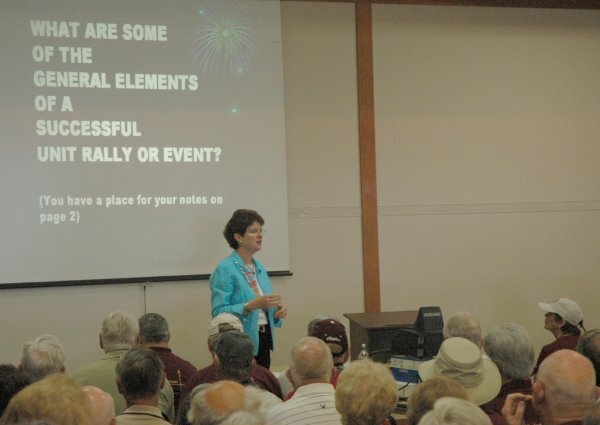 Nearly ten percent of the WBCCI 49th International Rally participants attended 4 hour and half seminars for Unit leaders. See the photo gallery! This is Renee Ettline presenting ideas for successful Unit events to an enthusiastic and involved group. The participation in these seminars illustrates just how much grassroots strength there is in the WBCCI. See the photo gallery to get a glimpse of another WBCCI International Rally experience. It used to be 3 months or 3,000 miles, whichever came first, when scheduling automotive oil change intervals. Those who were really particular would have their oil tested to help determine if an earlier interval was needed because of heavy service such as towing a trailer in the mountains. Things have changed. Engines are different and so is the oil. GM Oil Life System & Simplified Maintenance Frequently Asked Questions describes how modern vehicles can assist in maintenance scheduling. Because the onboard engine computers know how the engine is used, they can provide good guidance about when to change oil when the service is really needed. This reduces hassles and saves on oil use while still a high level of engine protection. Mike Dale at Motor.com describes the sensors (pdf) that are starting to be used so the engine computers can get a direct measure of oil condition to add to their engine use smarts. It won’t be long before every internal combustion engine driven vehicle will tell you when it needs oil or when it needs an oil change. 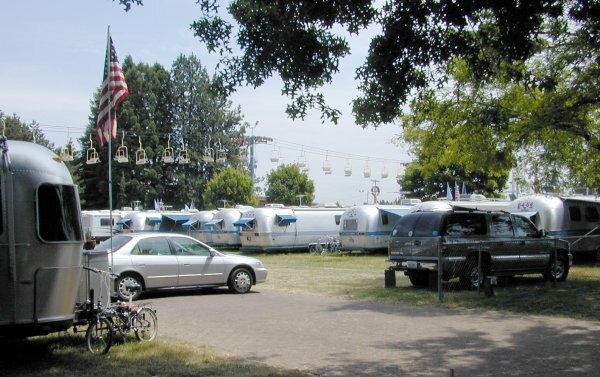 At the WBCCI 2006 International Rally in Salem, Oregon there were over a thousand registered Airstream RV’s parked at the State Fairgrounds. Here’s a photo gallery to give you an idea of what it was like.